The mollusc propels itself out of the ocean by shooting a jet of water at high pressure, before opening its fins to glide at up to 11.2 metres per second, Jun Yamamoto of Hokkaido University said. Olympic Gold medallist Bolt averaged 10.31 metres a second when he bagged gold in London last year. “There were always witnesses and rumours that said squid were seen flying, and we have proved that it really is true,” Yamamoto told AFP. 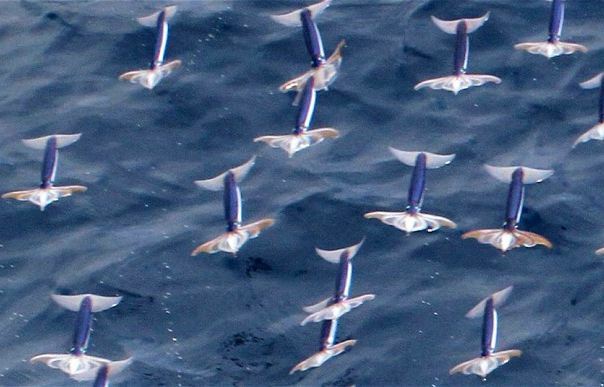 A picture researchers snapped shows more than 20 of the creatures in full flight above the water, droplets of water from their propulsion jet clearly visible. The squid are in the air for about three seconds and travel upwards of 30 metres, said Yamamoto, in what he believed was a defence mechanism to escape being eaten.